I haven’t done an outfit post in a while and though I do think I have an outfit or two photographed that I have yet to show you, I’ve been cooped up at home for the past couple of days and unless the outfit would consist of pajamas, I’m not feeling it. But luckily for you, I’m in a Lush mood and thought I’d share my entire Lush lip collection. Some of these items I own more than once (for example I have 3 bubblegum lips scrubs). I like to stock up on items that I love but also some were in gift sets (I have 3 honey trap lip balms as they were in a lot of the gift boxes from Christmas 2014). In the photo above you can see my entire collection but the items I own in multiples I just photographed once as I thought there would be no point in taking up space with repeat products. Let’s talk lip scrubs first. I have four different lip scrubs – Bubblegum, Popcorn, Santa’s and The Kiss. (I have multiples of only Bubblegum lip scrub and Santa’s lip scrub, both are favorites. Unfortunately Santa’s lip scrub isn’t vegan, but the others all are.) The Santa’s lip scrub pictured here is an old one from 2014, it also had those little edible hearts that you can see below in The Kiss lip scrub. 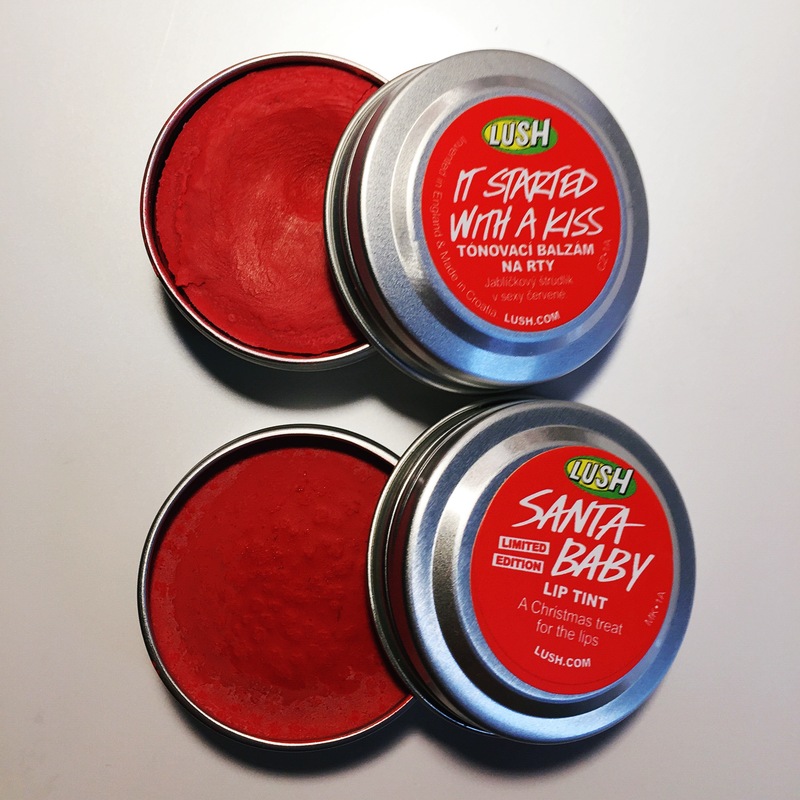 I think the new one was the same as this old one (I only have one Christmas 2015 Santa’s lip scrub and it’s in gift box, which is stashed away and I was too lazy to dig it up), however a lip scrub that has changed a lot is The Kiss. I actually threw my old version away as it got super nasty over time (it turned sticky and you couldn’t wash it off, it was a nightmare. I threw it away but Lushies convinced me to try it again and I am happy I did. The old version had sprinkles and I’m glad it’s just hearts this time.) The Kiss and Popcorn are slightly similar as they both contain salt. I like all of the ones I currently have in my collection, though I do have a soft spot for Bubblegum lip scrub, it was the first one I bought. Now the lip balms! As you can probably tell I LOVE Lush lip balms. 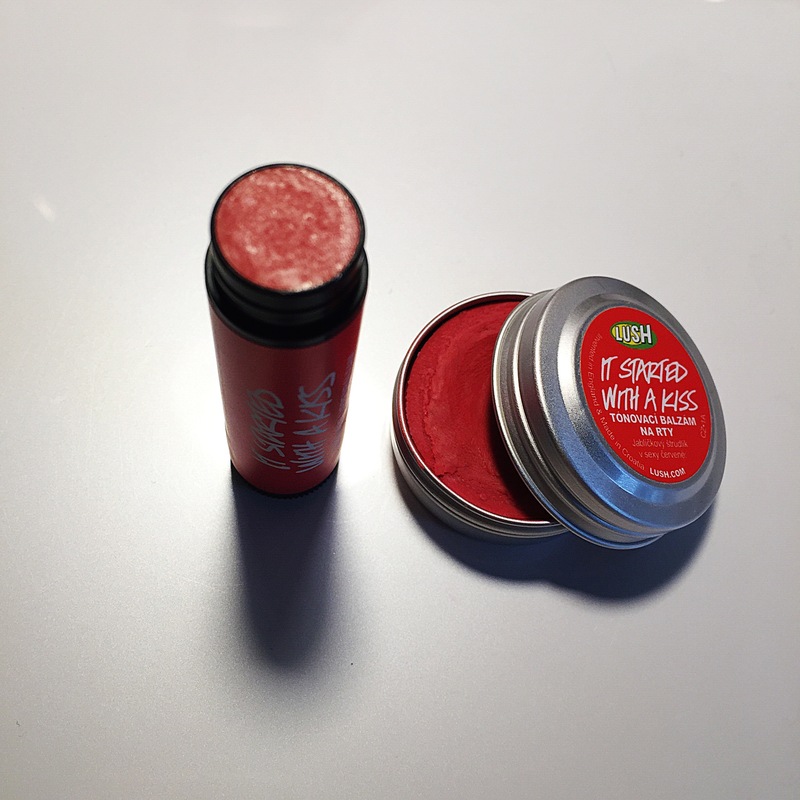 One of my favorites is Lip Service, which I have twice, but it’s not vegan as it contains bee’s wax. However, None of Your Beeswax is a great vegan alternative! My current favorites are Key Lime Pie and Passion Fruit, both smell amazing and feel lovely on. On to the lip stains (tinted lip balms)! These two below are from 2014, It Started with a Kiss and Santa Baby. Both have been re-released in 2015 but in stick versions instead of tin versions. It Started with a Kiss: the old version was more pigmented so I definitely prefer that one in terms of color, however, when it comes to applying it, the new version is much easier. You can see the difference in the swatch photo below, the old version is very messy (when applied with a finger) and both need more than one coat. 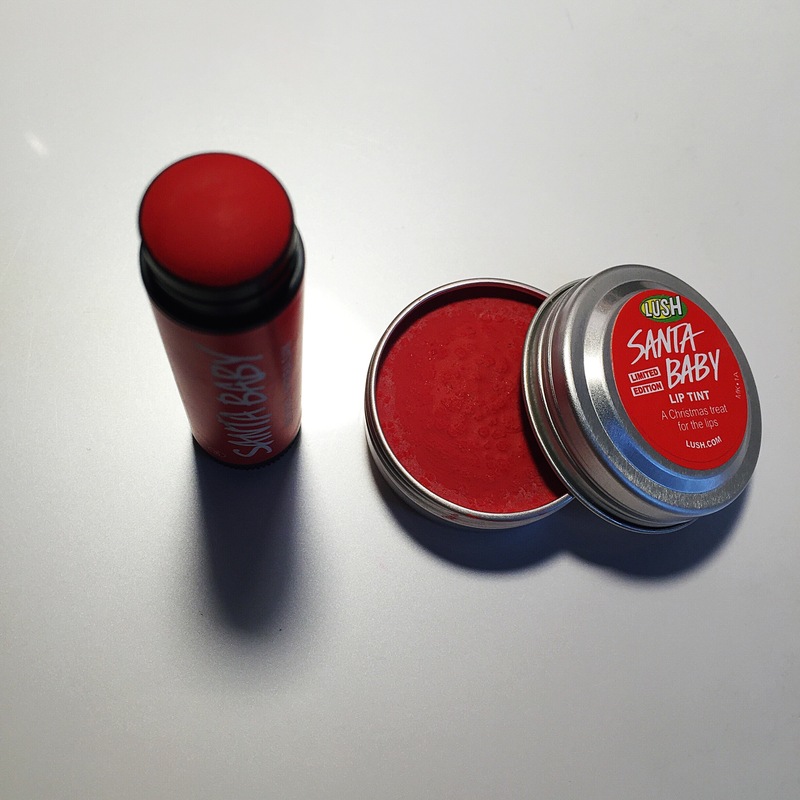 I wouldn’t repurchase this particular lip tint, because I like Santa Baby a lot more! Santa Baby: you can see in the swatch photo how lovely the color is (and all it took was one swipe/one brush of a finger to achieve this! ), this is my favorite tinted lip balm from Lush. The older version was drier than the new stick version but otherwise the color is the almost same. I tend to forget that I have it but I really need to start using it more! 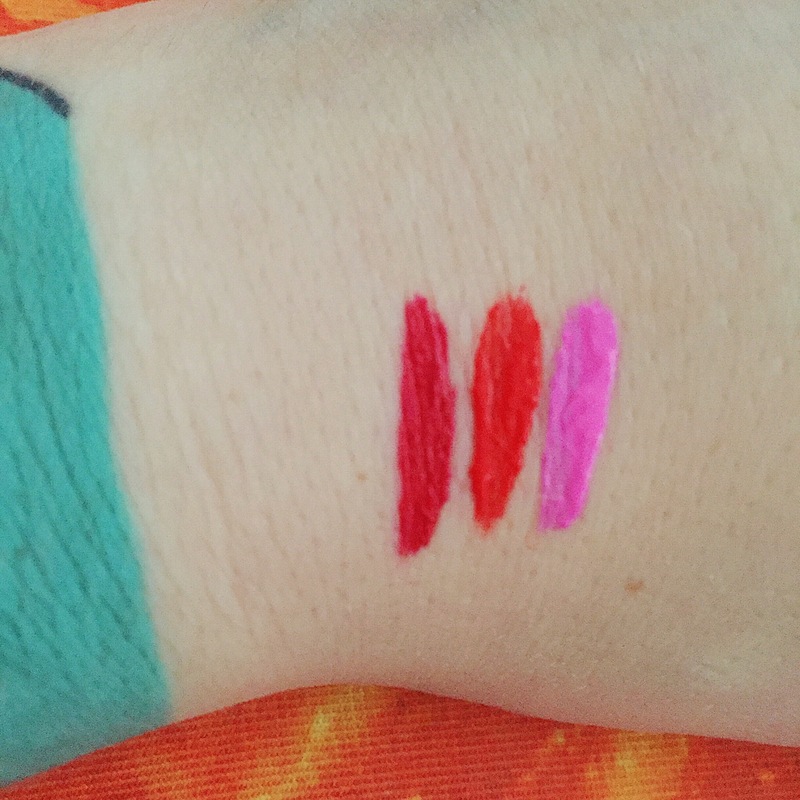 My last two lip tints are The Kiss (Valentine’s 2015) and Strawberry Bombshell. The Kiss is almost sheer with just a little sparkle (and didn’t show on my swatch photo), while Strawberry Bombshell is a lovely pink. You can see my swatches here. Santa baby is a lovely red, the stick version and the older version are almost identical except the older version was slightly drier, the new version is more hydrating and I love it. 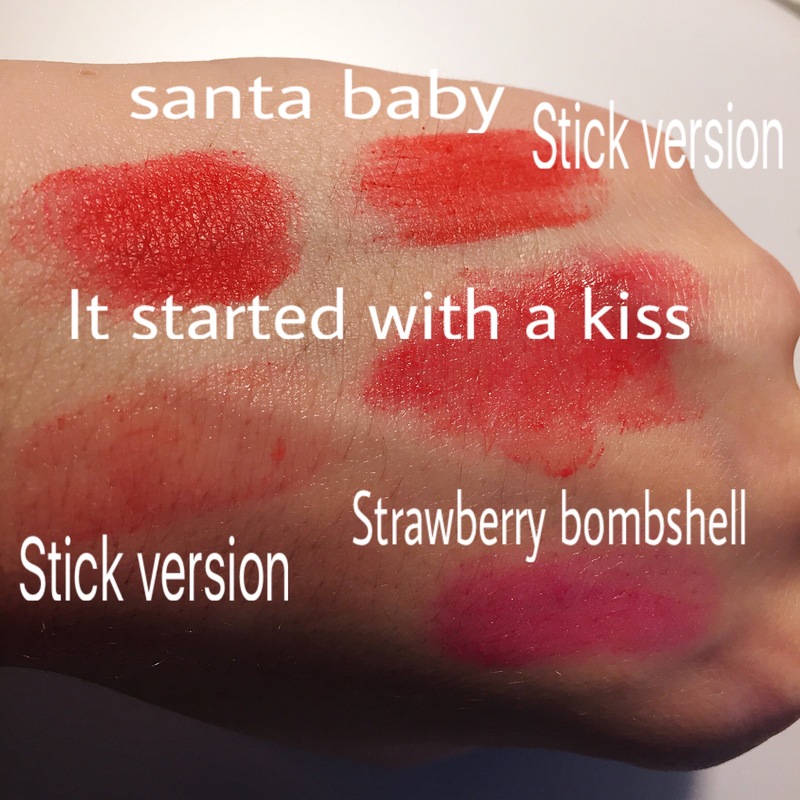 It Started with a Kiss is quite different from the old version – you can see that the pigmentation is much lighter in the new stick version. 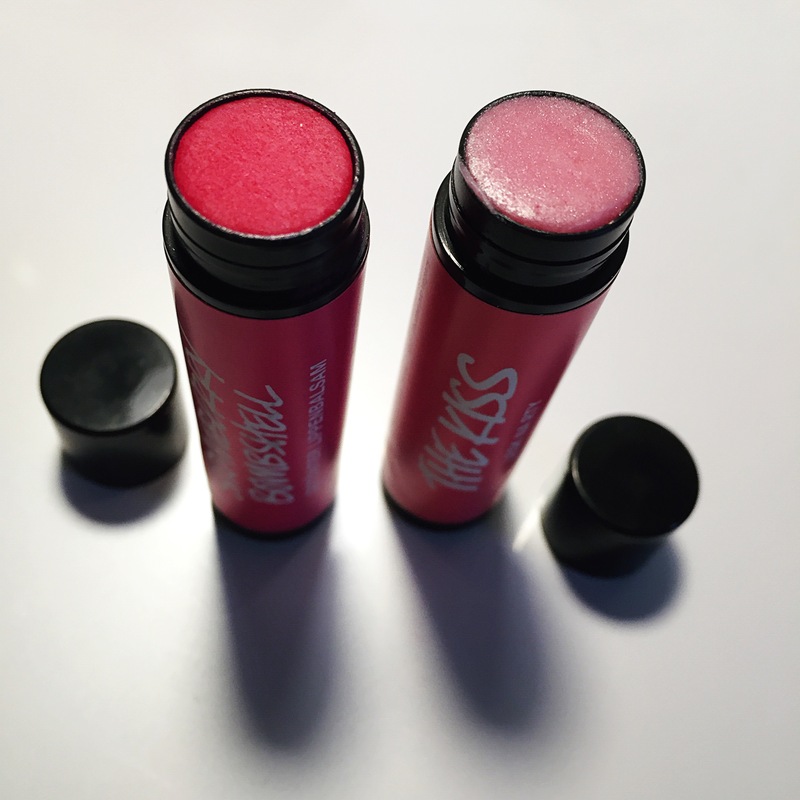 Finally the lip sticks – I have only these three: Decisive, Ambition and Glamorous. Decisive is the darkest and my favorite. I haven’t worn the other two yet but if they are anything like Decisive, they will last ages (seriously, I once wore Decisive to a grill party and it lasted all night with me eating the entire time). The only issue is actually getting it off, which took a while and using many makeup wipes. I love this post! I love lip products – I probably have more lipsticks/balms etc than any other makeup. 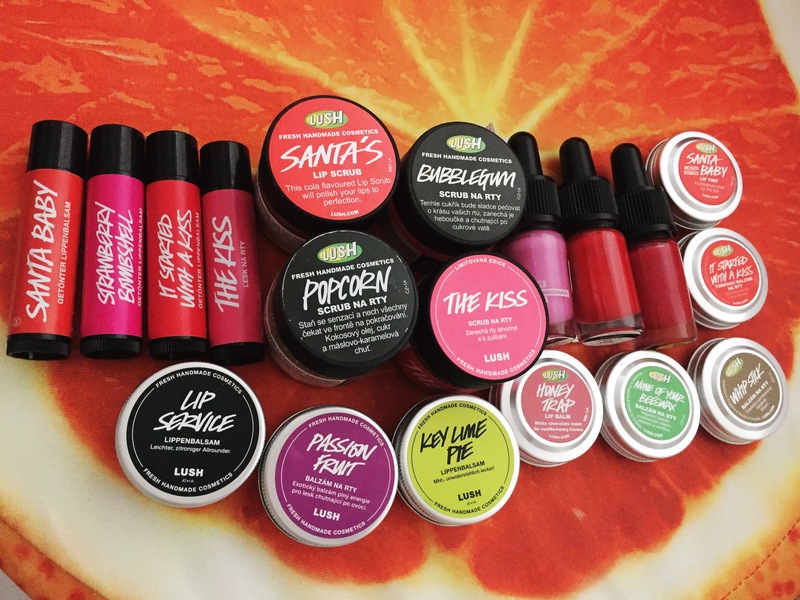 The lip stains and lipsticks look amazing, and I love the sound of the key lime lip balm! Yum. Wow Santa Baby is like a lipstick in pigmentation (actually I’ve probably tried tonnes of lipsticks that are more sheer). The only lip scrub I’ve ever used (and loved) was one from a Pout set, I bought before they went bust. It has sugar in it and tastes of sugar (!) I love it.